Both Mama Steph AND Mama Jo subscribe to Citrus Lane. I, Mama Jo, get the 2 year old box. 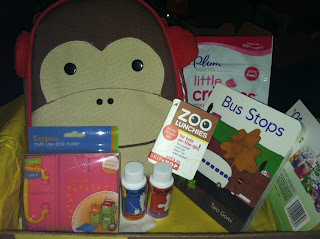 As you can see from the previous post, Mama Steph gets the infant box (for her baby on the way!). Sadly, this month did not come with one of the wonderful gift cards usually included, but there were good items, none the less. All things I could use almost immediately! Eco Me Dish Soap. Single Use Bottle. 1 oz. I am not sure how many dishes I can wash with 1 ounce? Not Thrilled. Based on Amazon value: 17 cents. They also included 2 coupons. One coupon was for 75 cents off a full sized Eco me cleaner. I will NOT be using it. They also included a 2 dollar off ANY Plum Organic Product. I will use this because, as many of you know, the food pouches and many other items are $2 or less at Target. This will result in my getting a free $2 item, so I would say it has a value of $2. Total Value of the box this month: $33.10. This is still a fairly good value. The box is $25 a month. However, you can purchase 3, 6, and 12 month subscription plans for cheaper. Right now, you can get an extra 20% off using the code 20LUV Boxes in the past have been a MUCH better deal. I hope that next month is better, and they include products (especially the largest item) that are more age appropriate. I still think it is one of the best deals around for a kids' subscription box, and I look forward to being a customer for many months to come! Want to order your own box? CLICK HERE and don't forget to use the code 20LUV for 20% off!